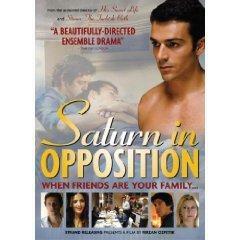 In Saturn in Opposition (Saturno Contro), director Ferzan Ozpetek creates a vibrant, vital film that deals with issues such as friendship, death, loss and grief. The film quickly establishes the relationships between a close-knit group of friends and then charts what happens when tragedy strikes. Successful writer Davide (Pierfrancesco Favino) lives with his lover Lorenzo (Luca Argentero). Others in the group include Davide’s ex-lover, Sergio (Ennio Fantastichini), married couple Neval (Serra Yilmaz) and Roberto (Filippo Timi), and successful therapist Angelica (Margherita Buy) and her husband, banker Antonio (Stefano Accorsi). Also in the group is the troubled, coke sniffing, pill-popping Roberta (Ambra Angiolini) and newcomer, doctor and budding writer Paolo (Michelangelo Tomasso). All these characters are introduced within the first minutes of the film, and it’s a bit overwhelming to absorb who they all are and their significance to one another, but no matter. Once the first few minutes of the film are over, not too many new characters are added, so it’s possible to settle in and just watch and enjoy this sensitive portrait of friendship. In adversity, some of these relationships are stretched to the limit, and sadly already-strained relationships cave in under the pressure. Just how these characters offer support and love is the substance of the film that showcases Ozpetek regulars. Ultimately this is not my favourite Ozpetek film, but then again there’s some stiff competition. I’d rank this one probably my least favourite with the following order: Steam, Facing Windows, Harem Suare, His Secret Life, and now Saturn in Opposition in last place. In some ways, Saturn in Opposition reminds me of His Secret Life–a death, and the friends who form an ad-hoc family of characters. I loved the scenes that depicted Antonio and Angelica’s children. The parental presence seems largely absent in this home, and instead the daughter dominates and terrorises her younger brother. Clearly the adults in the film prefer each other’s company with the children left–more or less–to their own devices. Friendship–rather than familial connections dominate here, and this is underscored by Lorenzo’s father and stepmother’s visit. They remain largely ignorant of Lorenzo’s personal life. Not a lot happens in Saturn in Opposition, but then again that’s the film’s structure, and the plot focuses on relationships not action. The film’s exquisite beauty is found in scenes with perfect shots–the empty bench, empty rooms and the final shot of the abandoned table–all echo the ephemeral qualities of life and the enduring relationships between friends. BURN director Gillo Pontecorvo’s scathing critique of colonialism is set against backdrop of the exploitative sugar trade of the 19th century. If you get over the problem of Marlon Brando playing a blond Englishman with a terrible accent, then this really is a marvelous film. 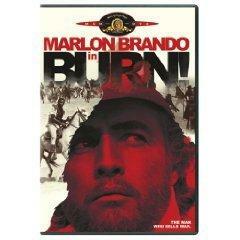 To Brando’s credit, this was the film he was the proudest of in his long career. The story is set in the 19th century, and begins when Sir William Walker (Marlon Brando) is sent by the British government to a small Caribbean island. The Portuguese, who now run the island, slaughtered the native Indian population and then imported slaves from Africa. The slaves work the lucrative sugar plantations, and the British seek to usurp the Portuguese as masters of the sugar trade. When Walker, the British government’s agent arrives, a slave revolt is brutally squashed and its leader garroted. Walker was supposed to fuel this revolt and ensure its successful conclusion, so he casts around for a new rebel leader, seeking someone who has “nothing to lose.” Walker finds what he’s looking for in charismatic slave Jose Dolores (Evaristo Marquez). By persuading Dolores to rob the Bank of the Holy Spirit, Walker manipulates circumstances in which the slaves must defend themselves against reprisals. Walker supplies arms, and soon a slave revolt takes place. This is a volatile period for those on the island. The sugar is rotting in the plantation fields, and somehow, the black slaves must be persuaded to stop the uprising, and get back to work accepting the yoke once more under the guise of employment. Walker is all too aware of Haiti as an example of a revolution “carried to [their] extreme consequences.” It may be useful to ignite a revolution, but it’s harder to stop it once it’s already in motion. One great scene depicts Delores–now a self-appointed general of the revolution as he enters a huge mansion to negotiate with the whites. The mansion is manned with black footmen, complete with powdered wigs. The slaves are ‘freed’ and the British take over the sugar trade on the island. But, of course, the slaves aren’t really free; they’ve just exchanged masters. One scene depicts Walker advising the local landowners on the merits of paying the former slaves for work, and he compares the situation of owning slaves vs. paying plantation workers to maintaining a wife vs. paying a prostitute for an hour. He asks “which do you prefer? Or should I say which do you find more convenient? A wife or one of these mulatto girls?” Then he proceeds to lecture about the salient characteristics of each situation based on economic factors: “what is the cost of the product? What does the product yield?” And in this manner, he breaks down human beings into units of production. It’s all simply a matter of economics for him. The film analyzes the nature of freedom and empire through the slave revolts. Both the Portuguese and the British fail to grasp the notion that: “If a man gives you freedom, it is not freedom. Freedom is something that you must take.” As Delores says: “If a man works for another, even if he’s called a worker, he remains a slave. And it will always be the same since there are those who own the plantations and those who own the machete to cut cane of the owners.” Delores grasps the fact that the whites need black labour: “they may know how to sell sugar, but we are the ones who know how to cut the cane.” Soon, the Royal Sugar Company has exclusive “rights of exploitation” and this ‘right’ effectively controls the island’s entire economy. Thus corporations run politics and people are no more than troublesome commodities. The film feels a little cheesy at first. Many of the actors are dubbed in English, so the result is poor. However, if you loved The Battle of Algiers, Burn is an excellent companion piece. By the half way point, it’s clear that we are privy to something truly extraordinary, for the story expands and presents some great universal truths through the difficult relationship between Walker and Delores. Some of the best scenes take place as Walker ponders moral questions. There is much to be learned from this film concerning warfare, empire, and human nature, and developing a conscience can be hazardous to one’s health when dealing with corporations, empires and colonialism. For as Walker says “that’s the nature of Profit. One builds to make money, and to go on making it, to make more, sometimes it’s necessary to destroy. Yes, I think perhaps it’s inevitable.” Burn is a great political film with a memorable musical score from Ennio Morricone. The true story of Sacco and Vanzetti is practically forgotten these days, but the 1971 Italian film directed by Guilano Montaldo recreates the politically charged murder and robbery case against the backdrop of the political insecurity of the times. America in the 1920s was in the throes of a “red scare” and increasing labour unrest. More than 25,000 Italians had been deported for a variety of reasons–including for their political beliefs and involvement in the labour movement. Following a payroll holdup on April 15,1920, that left several people dead, the police arrested two Italian anarchists for the crime. This riveting film plots the genesis of the case–from the arrests through the kangaroo court trial–to its ugly conclusion. Ultimately, Sacco and Vanzetti’s beliefs as anarchists go on trial. Vanzetti, a fresh fish seller eloquently explains that “anarchy would create a world without frontiers” but any attempts to explain his anti-war beliefs end in the accusation that he was a draft dodger (he went to Mexico in 1917). The film does an excellent job of showing the state’s fear and lack of understanding of anarchists, and the world’s reaction to the heinous injustice exacted on these two men for their political beliefs. The actors who play Sacco and Vanzetti look remarkably like their real-life counterparts, and the photography lends an eerie archival quality to the story. Well worth catching. 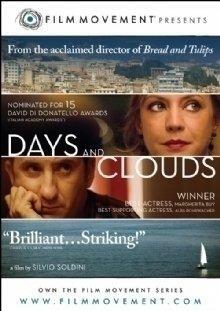 The excellent Italian drama Days and Clouds (aka Giorni e Nuvole) charts the disintegration of the marriage of an affluent middle-aged couple as their fortunes change for the worse. When the film begins, the very attractive Elsa (Margherita Buy) has just completed a long-held ambition to graduate from art school, and her husband, Michele (Antonio Albanese) gives her a pricey pair of antique earrings and throws a surprise party. But all this appearance of wealth is a façade. The party is over quite literally when Michele reluctantly reveals that he’s now unemployed and has been for months. A former company director, he’s been squeezed out by his partners as part of a restructuring move. Elsa is flabbergasted to learn that there is hardly any money left to pay the bills, and that their lifestyle must change radically. Blindsided by the news, she tries to gauge just how bad things are. The film follows exactly how this couple copes with the many changes they must face, and there are moments when they are both in denial about the severity of their financial crisis. Elsa has no idea how much their monthly expenses are, and so she must rapidly learn some of the very basic facts about their finances before even beginning to make plans. Michele, on the other hand, has a very difficult time accepting that he can’t pick up the check for all of his friends at the expensive restaurants they habituate. Shame soon leads both Elsa and Michele to cut themselves off from their friends as they sink from their affluent lifestyle to a working class environment without fancy vacations, pricey wines or valuable antiques. Director Silvio Soldini explored the dynamics of a marriage in trouble in his film Bread and Tulips, but in that film, the wife exploits an opportunity to run away. Not so in Days and Clouds where Elsa tries sticking to her marriage even as her formerly good relationship with Michele disintegrates as the money pressures mount. As the couple loses their material possessions, Elsa markets her job skills and puts her art restoration interests on hold, working two jobs. Meanwhile, Michele discovers that no one wants to employ a middle-aged executive. This all raises questions: was their marriage “happy” because it was coated with affluence, or is their relationship stressed solely to financial pressures? To exacerbate the situation, it’s also quite clear that once Michele is stripped of his ability to earn a living, on many levels, his wife vastly outclasses him. The film raises some intriguing issues, but while these issues appear for our scrutiny, they are not dissected and analyzed. For example, as the money pressures mount, we begin to wonder if Michele was really ‘protecting’ Elsa by keeping her in the dark about their financial situation, or if this was just one part of his continuum of denial. Through the course of the film, it becomes apparent that perhaps Michele contributed to his own downfall–certainly his ex-business partners think so. Elective Affinities is set in 19th Century Italy. Widow Carlotta (Isabelle Huppert) and Edouard (Jean-Hugues Anglade) meet again after a twenty-year separation. Their interrupted love affair immediately resumes, and they marry quickly. The blissful couple retreat to Edouard’s Tuscany villa, but when he announces that he’s invited his friend, architect, Ottone to stay, Carlotta is concerned that their solitude will be ruined. And it is …. Ottone spends an evening explaining how elements “give up original bonds and reform”, and he even draws a little diagram to illustrate his subject. This is so heavy-handed that it comes as no surprise when Carlotta decides to invite her stepdaughter, Ottilia is join the fun in the country–and the idea is, naturally, that the four people will be affected by each other and form new relationships. At this point, I thought I was perhaps about to watch some sort of film with a free-love message–you know–a sort of 19th Century Bob & Carol & Ted & Alice complete with bed hopping. I was wrong. The film degenerated into an overly-sentimental, queasy, self-righteous story with a heavy moral message. The guilty twist and suffer, and the morally correct characters are, well … insufferable. It was a little unsettling to see Isabelle Huppert play the role of Carlotta–rather a cold fish, and it was especially un-nerving to see her close-up dubbed speeches. Otto’s character was wooden, and Edouard rather unbelievable–his eagerness at several points in the film was quite nauseating. The one ‘steamy’ scene was tepid at best–and again–extraordinarily heavy-handed. From directors Paolo and Vittorio Taviani, Elective Affinities is based on the Goethe novel. We know within the first few scenes of the wonderful Italian film, I’m Not Scared that the protagonist, Michele (Giuseppe Cristiano) is a very unique boy. He has a moment of choice, and whereas many ten year olds would opt for the easy way out, Michele does not. Michele’s sense of morality is apparent, and in spite of peer pressure, he chooses the moral action. Michele, a quiet, introspective boy lives with his parents and his younger sister in a remote area of Southern Italy. The year is 1978. It’s an endless summer–glorious days are spent playing with friends, and running with careless abandon through fields of golden wheat. Michele and his friends play some of their games at an abandoned house, and it’s here, Michele discovers a boy his own age who lies chained in a filthy hole. I’m not Scared reminds me of The Devil’s Backbone in terms of the presentation of a child’s recognition of evil in the adult world. I’m Not Scared, however, does not contain elements of the supernatural. Instead this is the story of a boy who loves and obeys his parents, and then tries to reconcile a new horrible knowledge into his code of morality. The film, directed by Gabriele Salvatores portrays the child’s view of life exceedingly well. Too often, films resort to children as the know-it-alls–spewing out a ludicrous wisdom of life. Michele, however, remains a 10 year old boy–content to keep a secret, and yet simultaneously unaware of the ramifications of his knowledge. I’m Not Scared is a marvelous film in Italian with English subtitles. Lamerica from director Gianni Amelio is a political film set in Albania. Albania has just emerged from years of communist rule, and two opportunistic Italians, Gino and Fiore come to Albania to set up a bogus shoe factory. Fiore has done this sort of thing before. Gino–the younger man–has not. In order to set up the factory, the wheels of Albanian bureaucracy need to be greased. The plan is that investors or grants will fund the so-called factory, and the two Italians will set up the bogus company, grab all the money and run. This seems like a fairly simple plan, and one that has worked well for Fiore previously. The minute Gino and Fiore arrive in Albania, it is clear that they are in the midst of a highly unstable and volatile political situation. 100s of troops are in the ruined streets, and starving beggars hound the well-dressed, well-fed Italians. Thousands of Albanians are desperate to leave and will go to any lengths to join the crowds of refugees swarming onto every ship, train or bus heading for the border. Italian culture permeates the poverty-stricken country. Everywhere they go, the Italians trip upon elements of Italian culture in the most unlikely places. The starving Albanians are narcotized by Italian game shows, and Albanian parents will give away a child on the off chance that fame awaits in Italy. Gino seems doubtful that the plan can work, but Fiore is more confident. Albanian law requires the selection of an Albanian as the chairman of the company. The Italians require someone as a figurehead only–someone with no relatives, and their search leads them to the squalor of a former “model labor camp.” There, the Italians are introduced to a pathetic, filthy old man who is called Spiro Tozai. But Tozai is not quite what he seems. When Tozai goes missing, Gino begins the hunt for his precious ‘chairman’. Gino leaves the relative comfort and security of his hotel to search for Tozai. One by one, the layers that separate Gino from the Albanians are stripped away, and Gino finds himself as helpless and desperate as the average Albanian. Gino is not a sympathetic character at all. He has no time for the beggars who line the streets–he is simply out for himself. In contrast, Tozai–a man who has suffered years of deprivation in a labor camp, cares for his fellow men. Gino’s complete degradation becomes his journey towards joining the human race. There are only two professional actors in this film, and yet every performance was solid. Lamerica is a perfect film. I recommend it without reservations.